The capital city of Lithuania is Vilnius which is situated in the southeast of the country and part of the three Baltic States, the others being Estonia and Latvia. Between 1893 and 1916 Vilnius had a narrow-gauge horse tramway. Electric traction was introduced in Vilnius in 1956 when the trolleybus system was opened. There is an extensive network covering the entire city but not serving the streets in the old town. In 2013 the network was restructured, reducing a number of lines. At the time of the visit of the independent transport videos cameras, in May 2017, the trolleybus fleet consisted of over 230 Škoda 14Tr trolleybuses built between 1982 and 1997, some being acquired from Czech cities, plus a smaller number of Škoda 15Tr and 14TrM trolleybuses. There are also some 45 low-floor Solaris T15AC three-axle trolleybuses that date from 2004/6 and two MAZ 203T Amber Vilnis 12AC trolleybuses manufactured in Lithuania in 2012, of which number 1719 appears in this programme. The fleet is operated by VVT (Vilniaus viešasis transportas). Our filming begins in the city centre, where we see most types of trolleybus in operation. The cameras move along Vilniaus g. and Pylimo g. as we make our way to the busy forecourt of the main railway station – Geležinkelio stotis – to film the action. We then ride trolleybus 1655 on route 20 to Žirmūnų žiedas, a busy place and terminus for routes 6, 12, 17, 20 and 21. From here we join trolleybus 1116, another Škoda 14Tr, on route 17 to Kražių st. in the city centre for more filming which also includes shots taken along the picturesque bank of the River Neris. The next location is Senoji plytine, the terminus for routes 2, 10, 14, 19 and 21. Here we see the end of the morning rush and then travel back to the city centre on another Škoda 14Tr, 1658 on route 10, getting the driver’s eye view as we travel along. On arrival we see Tallinn Transport, Volvo 7900 hybrid single-decker bus, 2498 which appears to be on loan for evaluation, and one of the two MAZ 203T Amber Vilnis 12AC trolleybuses running in service on route 19. Our second visit on this DVD programme is to Lithuania’s second largest city – Kaunas, situated some 90km northwest of Vilnius. Like the capital, Kaunas operated a horse tramway from 1892 until 1929. The first electric transport arrived as late as 1965 when the trolleybus was introduced. At the time of filming, in May 2017, the system had a network of some 14 lines, with the latest sections being introduced in 2004. The trolleybus fleet at the time of filming was made up of Škoda 14Tr trolleybuses, of which some had been acquired from Plzeń and Tallinn and forty two low-floor Solaris T12 trolleybuses. Almost all trolleybuses are now in an all-over bright green livery, buses in overall red. The fleet is operated by AB Autrolis. Our filming begins at the railway station - Geležinkelio stotis – and then continues along Vytauto pr. in the city centre. Our cameras then ride on trolleybus 271, a Škoda 14Tr on route 7 to Partizanų g., which is the terminus for routes 7, 10, 15 and 16. With filming completed we ride on 003, a Solaris T12 along route 15, which returns us to the railway station, on the way passing a former Southern Vectis Bristol Lodekka open topper now an exhibit at a small transport museum! We have also included some still photographs taken by Steve Kelly on journeys he made to both Vilnius and Kaunas in 2004 and 2007. 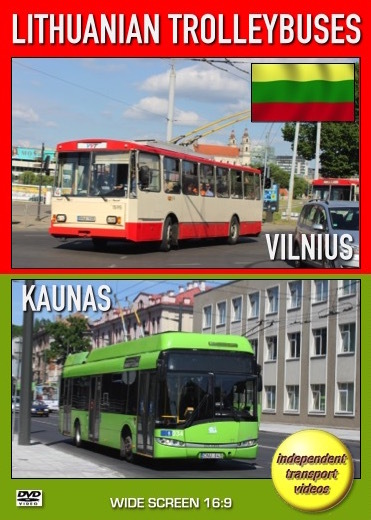 We are sure you will enjoy this cornucopia of trolleybuses when you view this programme from the lovely Baltic State of Lithuania!